Who doesn’t like a good story? 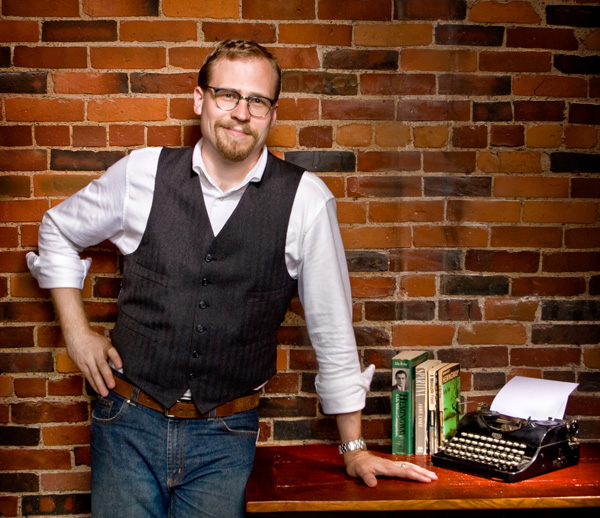 Joshua Bodwell, 35, the executive director of the Maine Writers and Publishers Alliance, certainly does. Since 1998 Bodwell has been involved in the writing community in southern Maine as both a contributor and publisher. Last year, Bodwell brought Andre Dubus III to the Louis T. Graves Memorial Public Library in Kennebunk to speak about writing and, at that event, someone from Thornton Academy heard him speak. For Bodwell, even during a time when he is dealing with a very painful illness, his boundless enthusiasm for all things connected to the written word comes through. He described in detail a national poetry contest for high school students that has been hosted in Biddeford for the last two years. “I love the Poetry Out Loud competition,” he said, his voice and demeanor gathering steam as he talked about this year’s competition. Despite his relatively young age, Bodwell is well known locally and nationally as both a writer and publisher. Within five years of his 1993 graduation from Kennebunk High School, Bodwell helped create the company Clamp Down Press. This Cape Porpoise-based publishing firm focuses on producing a small number of limited-edition pieces of fiction and poetry. Bodwell and his company work to use only traditional printing techniques, such as letterpress, wood cuts and serigraphs to produce work. As a writer, Bodwell has worked in a number of different genres, and many people in southern Maine know him for his earlier work as a reporter and columnist at a weekly paper in southern Maine. During his two years at the paper, Bodwell quickly learned the power he had with his words and columns, and his peers recognized him for this work. In one of his stories, Bodwell went back to his old high school and looked at the way it described courses taught at the school. He recognized that in their program of studies, Kennebunk High School lavishly praised their advanced courses and spent very little time or space on its general and technical classes. In 2006, he won an award from the Maine Press Association for these stories and because of his writing, the school changed the publication. As Bodwell polished his craft and immersed himself more and more in the world of long stories and features, he came to recognize the work of Andre Dubus. Dubus lived in Haverill, Mass., and Bodwell thought that because he was so close he could connect with the short story writer. He sent off the letter and wondered if he might be able to meet the author. “About a month goes by and I don’t hear anything,” he said as he tugged at his short beard and thought about the letter. Shortly after, Bodwell read in Book magazine that Dubus had died. Bodwell assumed that would be the end of the story. “Another month went by,” said Bodwell. And then one day he received a simple plain envelope in the mail with a return address declaring it had come from someone named Dubus. “It was a brief letter from his son, Andre Dubus III,” he said. He thanked me for the letter I sent to his father and said that as his son, it meant a lot him. According to Bodwell, the two have been friends ever since. Bodwell said this not as a fan, but a writer who appreciated the image and the thought behind the act. Today, Bodwell and his partner, Tammy Ackerman, live and work in a bright orange building in downtown Biddeford. It somehow seems to fit him. Proudly parked in one corner of the first-floor office is a World War II-era Schwinn bicycle. On nice days, Bodwell rides it around town and it, too, seems at home in the design studio. Both Bodwell and Ackerman have immersed themselves in the community and hope to make the area a center for the arts of all sorts. Collaboratively, they have started Engine, a nonprofit community-based organization dedicated to revitalizing the downtown area. The couple also started a small communications and graphic arts firm, North40Creative, which focuses on managing and creating communications content for its clients. But beyond all of this, and his work with the Maine Writers and Publishers Alliance, Bodwell considers himself a writer. Neighbors is now online! Check out the expanded and unique stories that are now part of our online column. Http://eCourierMaine.com Let us know what you think and what you would like to see with this new digital version of our stories. Just wanted to say I really enjoyed your article on Neighbor Joshua Bodwell. He & his wonderful partner Tammy have done so much for Main St., and the Biddeford Saco community. Keep up the good work & we’ll keep reading your work!!! Hi Kathryn – thank you for the kind words. I am trying to write interesting stories about people or places in our community and I think Josh and Tammy certainly fit that description. Thanks again and if you know someone has an interesting story to tell, please let me know.